MK “Ketzaleh,” nearly given up for dead in the Yom Kippur War, warns the government is blind to the Egyptian Muslim Brotherhood threat. 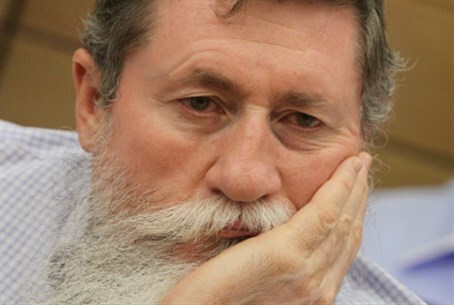 National Union chairman and Knesset Member Yaakov Katz (Ketzaleh), who was nearly given up for dead in the Yom Kippur War, warns that the government is blind to the Egyptian Muslim Brotherhood threat. MK Katz was deputy company commander in the elite combat unit Sayeret Shaked and was seriously wounded in the war 39 years ago. Ariel Sharon, who then was an IDF commander, is credited with saving his life by insisting that he be evacuated for medical care, despite the fact that his wounds appeared to be deadly. MK Katz, through a statement issued by his office, said, "Egypt now is deploying tanks in the Sinai Peninsula and sending armed soldiers with the intent to harm Israel. Egypt surprised Israel in 1973 by rolling its tanks into the south as Jews throughout the country were praying in synagogue on Yom Kippur. "As on the eve of the Yom Kippur War, Israel still is closing its eyes in the face of Egyptians terrorists who are Muslim Brotherhood President Mohamed Morsi’s best friends and carry out his previous declarations for the destruction of the State of Israel. “Morsi fools Israel with the same powers that [Anwar] Sadat used when he was president of Egypt. Israel must wake up an act accordingly." Sadat signed the 1979 Peace Treaty with Israel and later was assassinated. MK Katz also noted that as chairman of a Knesset committee on African infiltrators flooding Israel, he carried out the first tour to see the problem first-hand at the Egyptian border three years ago and heard IDF officers say that a security fence along the border was needed to prevent the infiltration of Egyptian soldiers despite the peace treaty. The government still is building a fence, and Egyptian terrorists two days ago killed one IDF soldier and wounded another in an attack along the border where the fence has not yet been erected. The terrorists followed African infiltrators and attacked the IDF when several soldiers left their post to offer water to the migrants.